It’s been four long years since Microsoft released the last version of Office for the Mac, in 2010. And it will be one more before the next version arrives, Microsoft said Friday. 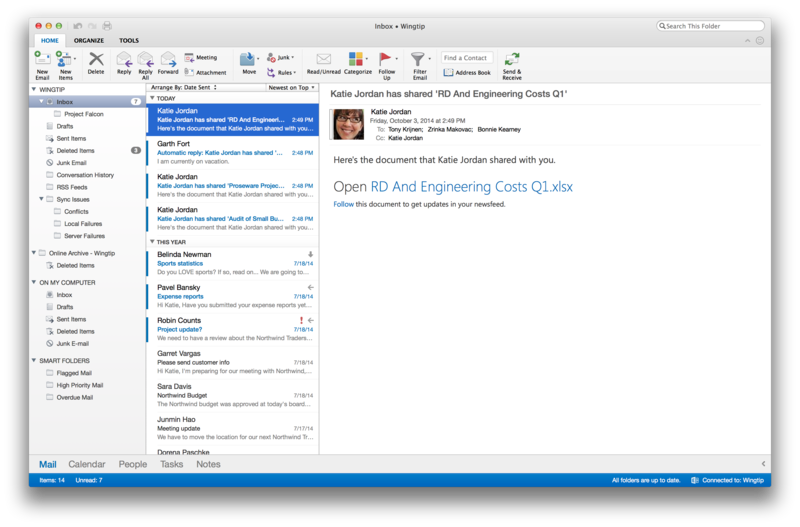 But to tide you over until then, there’s a new version of Outlook. Although Microsoft released the latest version of its email client on Friday, the roadmap to the next version of Office is the real news. In the first half of 2015, Microsoft will release a public beta version of Office for Mac, which includes Word, Excel, PowerPoint, and OneNote. In the second half of 2015, the company said, Microsoft will ship the final version. Current Office 365 subscribers will be able to upgrade for free, as expected; Microsoft also said that it would ship a “perpetual license of Office for Mac” (aka a standalone version) in the same timeframe. Given that Office 365 users are still stuck using Office for Mac 2011, however, there hasn’t been much incentive to sign up for Office 365—save for the excellent Office for iPad apps, OneDrive cloud storage, and free Skype calls. For those familiar with the Outlook Web App or Outlook for Windows, the new Outlook client should hold few, if any surprises. Among the new features Microsoft promised for the new Outlook client are better performance and reliability; push support for real-time email; faster first-time syncing with Exchange, and better syncing with Windows and the Outlook Web App; plus online archive support for searching Exchange. And, of course, the new Office interface. Here's how to get it: Consumers should visit their My Account page, while commercial subscribers should click on their Software page or accessing their Office 365 portal. Why this matters: Basically, Microsoft hopes to lure Mac users to its perpetual subscription model, in much the same way it’s hoping to persuade its traditional Windows customers to do the same. The new version of Outlook is just an example of what you’ll receive. Nevertheless, it will have been five years since Microsoft has released a new version of Office for the Mac by the time it finally ships. Will that be too late?